Eric studied Medicine at St. Mary’s Hospital Medical School, University of London and completed his MBBS in 1998. Having passed the MRCP postgraduate medical examination, he furthered his training in Radiology at Guy’s & St Thomas’ Hospitals in London and obtained the FRCR postgraduate radiology examination. He gained the prestigious FRCP Edin and the EBCR diploma for his work in cardiothoraic imaging. He is a full time Consultant Radiologist with appointments at Buckinghamshire Hospitals and Guy’s & St Thomas’ Hospitals NHS Trusts. He practises at Stoke Mandeville and Wycombe hospitals and one day a week undertaking specialised Cardiac Imaging at St Thomas’ Hospital London. He lectures at National and European Head and Neck and Cardiac Imaging conferences. 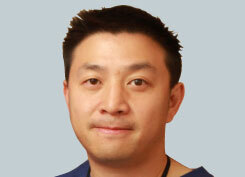 His research interests include imaging of ENT/maxillofacial disorders and cardiac MR.